Do you want to print just one map and directions? In the print dialog box, in the "Page Range" section, choose "Selection"
We meet in the Education Building - located behind the church in the parking area. Note: ALDA-Peach is not affiliated with the church, however they are kind enough to loan us this meeting space. Directions: From I-285, exit onto Lawrenceville Highway and go outside the perimeter. The church is approximately 1/2 mile up on the left. The church sits off the road, so be looking for the sign. If you reach the QT Gas Station, you have gone too far. Directions: From I-85, exit onto North Druid Hills Rd NE and turn south. Travel almost 2 miles (1.9 miles). La Parrilla Mexican Restaurant will be on the right. If you reach LaVista Road, you have gone too far. Drive about 3.3 miles and the 230 E Ponce De Leon Ave Building will be on your RIGHT. The 230 E Ponce De Leon Building will be on your LEFT. exit on 17th Street (exit 251A) and turn LEFT onto 17th Street NW. drive for about 0.4 miles and turn RIGHT onto Atlantic Drive NW. Immediately turn RIGHT onto 19th Street NW. Regal Cinemas will be on your LEFT. take Exit 250 toward 16th Street / 14th Street / 10th Street. keep to the RIGHT and take the 16th Street ramp. take a slight RIGHT onto 16th Street NW. Immediately turn RIGHT onto Market Street NW. Immediately turn LEFT onto 19th Street NW. Regal Cinemas will be on your RIGHT. exit on 17th Street (exit 84) toward 14th Street / 10th Street. Keep RIGHT to take the 17th Street ramp and turn RIGHT onto 17th Street NW. Immediately turn RIGHT onto Atlantic Drive NW. Regal Hollywood Stadium 24 will be on your RIGHT. drive for about 0.8 miles on the NE Expressway Access Rd. Directions: From I-285, exit at LaVista Road and go inside the perimeter. The restaurant is on the left just under 1 mile inside I-285. Drive past Northlake Mall and you will find the restaurant on the far/left corner of the intersection with Montreal Rd. Montreal Rd. is the first street on the left after you pass Northlake Mall. 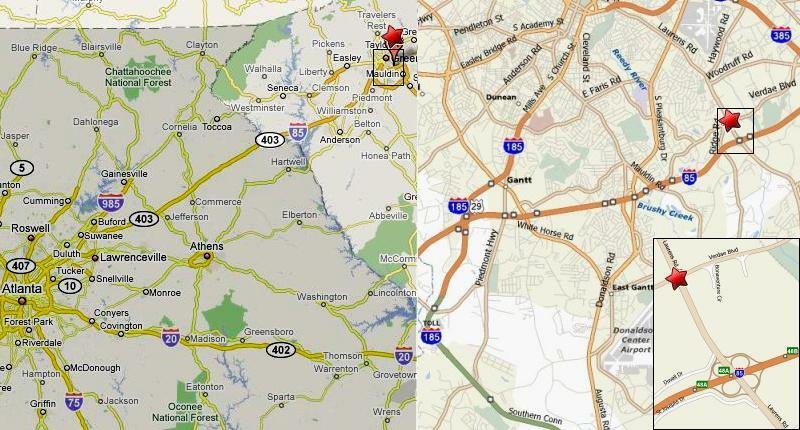 Directions: From I-285, take I-85 North to Greenville, South Carolina. At Greenville, stay on I-85, passing the I-185 Greenville perimeter freeway. so you can curve around the cloverleaf and head north on Laurens Rd. just past the intersection with East Parkins Mill Road/Verdae Boulevard. Directions: From I-285, exit at Memorial Dr (exit 41) and turn inside I-285. The office building will be on the left about 1 mile inside of I-285. If you reach the Covington Hwy intersection with Memorial Dr, you have gone too far. The World of Coca-Cola is on the near / right corner of Centennial Olympic Park Dr NW and Baker Street NW. Directions: From I-285, exit onto Lawrenceville Highway and go outside the perimeter (I-285). Left stays on Lawrenceville Hwy, Right becomes Hugh Howell Road. Longhorn Steakhouse will be on the Right side of the road, right at the fork. Directions: Atlanta Botanical Garden is adjacent to Piedmont Park on Piedmont Avenue. Coming in from the North (traveling south on I-85 or I-75), turn Left -> 14th Street and cross over I-75 / I-85. Coming in from the South (traveling north on I-85 / I-75), turn Right -> 14th Street. When you get to Piedmont Ave (about 3 blocks east of I-75 / I-85), turn Left -> Piedmont Ave.
Continue on Piedmont past 14th Street and Piedmont Park. The Atlanta Botanical Garden is on the right across from The Prado. Huntington Condominiums will be on the left... turn left into the second entrance. Once you turn into the second entrance, keep to the right and you will quickly find the clubhouse. Exit at 14th Street. Turn EAST on 14th (toward Peachtree Street). Turn Left onto W. Peachtree Street (at the second traffic light). Get into far left-hand lane (on W. Peachtree Street). Turn Left onto 18th Street (just past the Atlanta Ballet on your left). Cross Spring Street (while on 18th Street). Turn Right into our parking lot (in the Selig Center). Drive for about 1/2 of a mile, then turn Right onto North Indian Creek Drive. The Atlanta Area School for the Deaf will be on the Right about 1/3 of a mile down the road. Directions: From I-285, travel WEST on I-20 for 12.9 miles. Exit at Fairburn Rd (Exit 37) and turn Right at the end of the exit ramp. Drive 0.8 miles - and turn Left at Hospital Drive. Drive 0.4 miles - 8657 Hospital Drive will be on the Right. Exit at Chapel Hill Rd (Exit 36) and turn RIGHT at the end of the exit ramp. You will be turning onto Cambellton Street (Chapel Hill Rd changes names just north of I-20). Drive 0.1 miles - and take the first Right at Hospital Drive. Drive 0.7 miles - 8657 Hospital Drive will be on the Left. Travel about 2 miles on North Druid Hills Rd NE. The restaurant will be on the RIGHT. If you get to Clairmont Rd, you have gone too far. Travel north on I-75... about 26 miles north of the I-75N/I-285 junction. and turn RIGHT onto Red Top Mountain Road SE. Travel about 1.3 miles to get to the West Entrance into Red Top Mountain State Park. Picnic Shelter #7 is at the end of the road... surrounded on three sides by Allatoona Lake. Callanwolde will be on the LEFT. Panera Bread is in a strip of shops on the RIGHT in the "Emory Village" area. turn LEFT onto Briarcliff Road NE and drive for about 0.7 miles, Callanwolde is on the RIGHT. Exit at Lavista Rd and turn to the outside of of I-285. Turn RIGHT at your first opportunity onto Northlake Pkwy. Turn RIGHT at your first opportunity onto Crescent Centre Blvd. The Piccadilly Cafeteria will be a short distance down this road on the RIGHT. Exit at Moores Mll Road. Turn EAST onto Moores Mill Road (if northbound on I-75, turn RIGHT, is southbound on I-75, turn LEFT). Drive almost 3 miles (2.9 miles)... Moores Mill Road will change names to West Paces Ferry Road. 120 West Paces Ferry will be on the RIGHT. Take exit 250 for 16th St toward 14th St./10th St. Turn LEFT on Arts Center Way to enter the Woodruff Arts Center Garage on the RIGHT. Disabled parking is available in the Woodruff Arts Center Box Office lane off Peachtree Street N.E. at 15th Street. Handicap drop-off is also available on 16th Street. If you were traveling NORTH on I-85, turn RIGHT onto North Druid Hills Rd. If you were traveling SOUTH on I-85, turn LEFT onto North Druid Hills Rd. Travel a little over 2 miles on North Druid Hills Rd. Turn RIGHT onto Clairmont Rd.